When I began shooting people abroad, I searched the internet for days trying to find useful resources about cultural photography. I did find some good content, but mostly I was unhappy with the approach. It was very technical. I don’t think that’s wrong, but it just wasn’t the information I was looking for. So when I started documenting the Nepali culture on the side while working in disaster relief, it all was figuring out step-by-step for me. 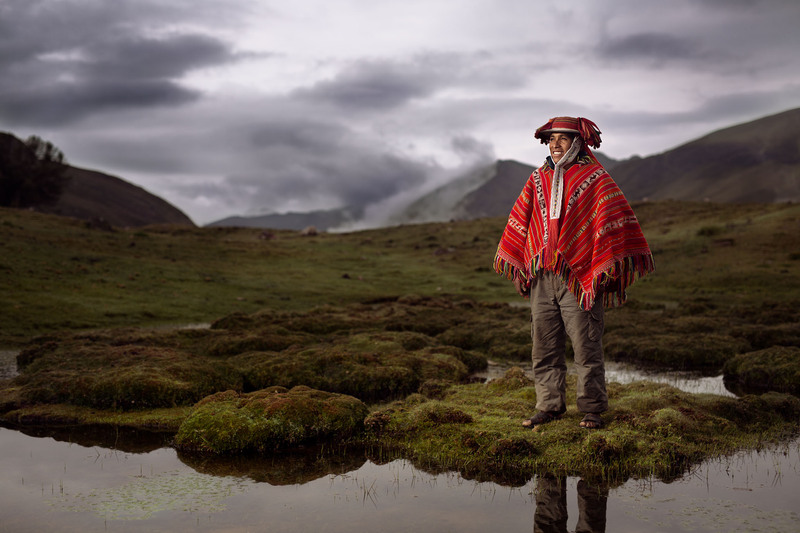 This year, I stayed for a month in Peru to photograph the indigenous culture there. In this blog series, I will cover my preproduction, on location and postproduction process during this project and additionally share some extra tips. First, you need to discover a story that speaks to you. Preferably you already know about it and just need to dive into the subject. Alternatively, you can find inspiration everywhere: From fellow photographers, google research or documentaries. Talking to your friends also opens doors to fields you didn’t even consider. When you’ve found your project, research the hell out of it. Learn about the place, the people, their history, their interests, the politics, the social relationships, etc.. Are there any other photographers who did similar projects? Try to get in touch with them. As you see, this process can take days if not weeks. Once you finished the research (spoiler: it’s never finished), you need a local contact. Because what makes cultural photography in another country so tricky is that you don’t have your network with you. It’s like a blank page that needs to be filled. Maybe you don’t speak the language, which makes everything even harder. Here’s where the importance of local hits. Find someone with a network and get in contact with them. It may be a fellow photographer, a fixer or somebody from an entirely different field (your client for example). The single most important thing is that you can communicate with them. I once accompanied a local who wasn’t able to speak with me. The project didn’t turn out well. To find a local of course can google “fixer + city” or “photographer + city”. Joey Lawrence wrote an exceptional post about finding a fixer in 2011. Here I want to introduce you to an additional option. Just search for “Expats + city” on Facebook. I’m sure you’ll find a huge group of international people living there, all able to communicate with you (sometimes even in your mother tongue). Present your project and ask if somebody can help or knows somebody who can. Those groups can also be an excellent place to find new projects. Just offer your service and cherry-pick the once you like most. 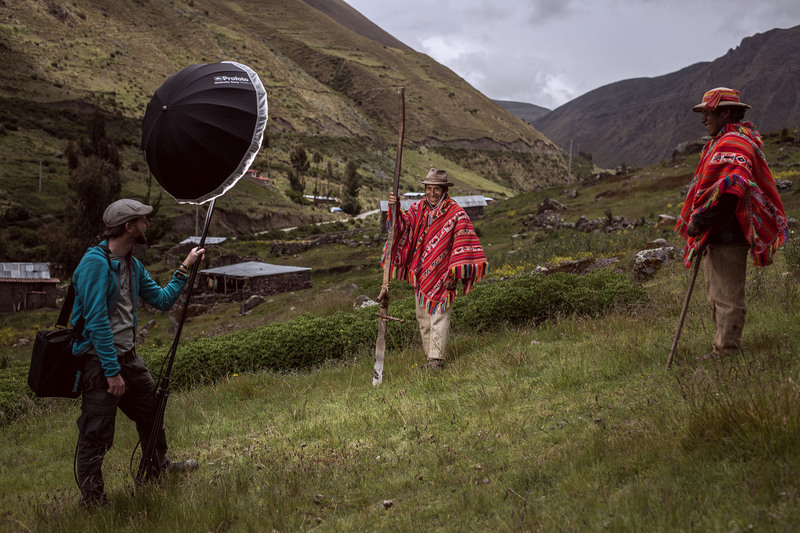 That’s the way I created some projects in Peru. Also, I like to work with a client because collaboration drives me and I just love seeing my photos getting used online or in publications. My local client Marc was a huge help assisting me to take the photographs we needed. If you’re interested in balancing ambient and flash, check out my last post about Broncolor HS as well. We all want our gear to be protected, especially during air-travel where we don’t have control over our luggage. So here’s my approach: My cameras, batteries, and lenses are in the carry-on. I put them in a Mountainsmith Kit Cube and throw this piece into my North Face Duffel Bag S. It’s always over the 8kg weight restriction, but I never had a problem at all. If someone would check me, I’d just take out a camera and carry it around my shoulder. Another option to bring more stuff is to put some lenses into the pockets of your jacket. If I take lighting equipment with me, I put all this gear into a ThinkTank Logistics Manager 30. Most other photographers use a hardshell suitcase like PeliCase, but I don’t need this extra protection and weather sealing. Plus, the ThinkTank is very light, you can put in more gear! However, I do make sure to add some extra-padding on the flash heads. Airlines don’t allow spare batteries in the checked baggage. Check if there’s conformity for gear and batteries. Your flash is a big box full of wires. It will look suspicious. Attach a manual to the flash so the TSA officer can see the use of your device. BTW: This also applies to drones. Okay, don’t trash your gear. But make it look like it’s crap. By doing so, every thief who sees your fancy camera just will think it’s broken and not worth a penny. I highly recommend taping over logos and add some duct tape around the edges. Funnily, I found another advantage of this method: If you treat your camera body as harsh as I do, it will protect your gear from scratches. If you have any additional tips and tricks you’d like to share here please hit me up on Instagram or Facebook!